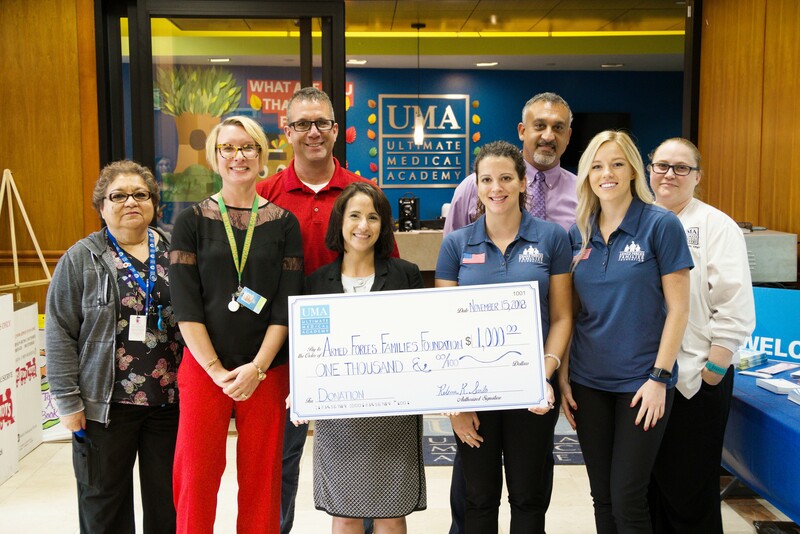 CLEARWATER, Fla. – Ultimate Medical Academy concluded an extended Veterans Day celebration on Thursday, Nov. 15 with a donation to the Armed Forces Families Foundation (AFFF) in Clearwater, Florida. Last year, AFFF donated a $47,000 playground to families stationed at MacDill Air Force Base. The check presentation concluded the nonprofit educational institution’s three-day Veterans Day appreciation event, which included a welcome to work for UMA faculty and staff and Veterans Day appreciation wristbands on Nov. 8, posting social media messages expressing gratitude to veterans, and thanking UMA veterans by sharing three UMA employee service stories, including Reeder’s, in an email from UMA President Derek Apanovitch on Nov. 12. Ultimate Medical Academy is a nonprofit healthcare educational institution with a national presence. Headquartered in Tampa, Florida and founded in 1994, the school has more than 45,000 alumni and offers content-rich, interactive online courses to 15,000 students as well as hands-on training to hundreds of students. UMA students have access to academic advising, one-on-one or group tutoring, resume and interview coaching, job search assistance, technical support, and more. UMA is institutionally accredited by the Accrediting Bureau of Health Education Schools (ABHES). Learn more by visiting https://www.ultimatemedical.edu/.